A few weeks ago, I shared with you my La-Z-Boy Design Dash “White Room Challenge” experience (click on the blue words to be taken to the post). It was stressful and exhilarating all at the same time! Well, it’s time to see ALL of the rooms designed by some of your favorite bloggers and to vote for your favorite room design. Voting started yesterday and will continue until December 20th. You can vote once a day for your favorite room, and get this, by voting you are entered to win $10,000 worth of La-Z-Boy furniture!!! Below is what you will see on the La-Z-Boy facebook page when you click on the contest link. You can watch my minute long video and then click “VOTE and SHARE” underneath the video to register your vote. Of course I’d love to have your vote, but all of the rooms are amazing–so no hard feelings if you choose to vote for a different room ;). To sweeten things even more, La-Z-Boy is allowing me to give away $500 La-Z-Boy store credit to one Home Stories A to Z reader! Woohoo! If you haven’t been into a La-Z-Boy showroom recently, I think you’ll be pleasantly surprised with the selection and options available. I know I was! To enter the $500 store credit giveaway, please follow the prompts in the Rafflecopter widget below. 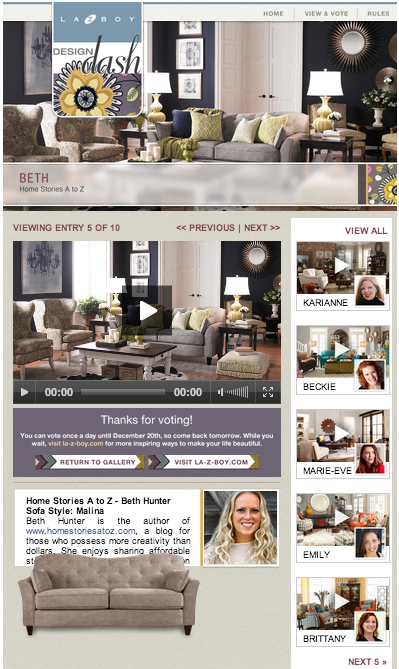 Good luck and don’t forget to also vote each day for the $10,000 Design Dash giveaway! I would buy the Allegra Stationary Occasional Chair, it’s been on my wishlist for awhile now. Thanks for the giveaway Beth! Visited Lazboy and love the Elisabeth Stationary chair! I so need this store credit, we’re moving and will be needing new furniture! I’m off to vote! Visited and I really like Collins Premier Stationary Loveseat in Midnight! Man, I thought I loved my lazboy couch until I saw this! Beautiful choices! We love our La-Z-Boy recliner couch! Love the room! I’d have to get the Kyle recline in Kahlua…..we love the La-Z-Boy recliners!! Crushing on the Tribecca Etagere! Love! Love the leather recliner sofas!! I like the Leah Supreme Comfort Twin Sleep Chair. It’s always nice to have a few extra places for overnight guests. I love the Charlotte High Leg Recliner. I would probably get it in the Ecru colorway. What a beautiful room! Thank you for the opportunity to win! I really like the Kiefer Ottoman. I love the Eden Sofa & Ottoman W/ Chaise Cushion in the color Putty (it is like a gray). I would also add this chair, Eden Stationary Occasional Chair in the color Putty. We need to redo our entire living room. I’d pick the Eden Loveseat! I want the Delaney premier stationary sofa! I like the Hidden Treasures Accent Chest! I kind of like the Elisabeth Stationary Occasional Chair. Lots of cute stuff! You did such a wonderful job on this room! I always thought that Lazy boy meant recliners until one day I went in and purchased the most beautiful quality chair that I have ever owned. It’s our favorite chair and it is not a recliner but a beautiful statement piece.I can’t wait to get more furniture from Lazy boy. I would choose the Delaney love seat for my home now. I love the Trevor Full Reclining Sofa. I love the Metro Sofa! Great job on that room! I sure could use some new furniture! Ha! That was so weird. They have so many great options that I can’t believe we originally chose the same one! I was the only one who stuck with my original choice though ;). I love your design! I’m partial to neutrals. Good job! Larson recliner – for my hubby, of course! I would love to get a recliner for my husband – he’s wanted one for 26 yrs & we always put it off for other things. I really like the Faris low profile recliner but I would let him pick it out. I would choose the Joshua Reclina-Rocker Recliner in Pewter. love the room great job! 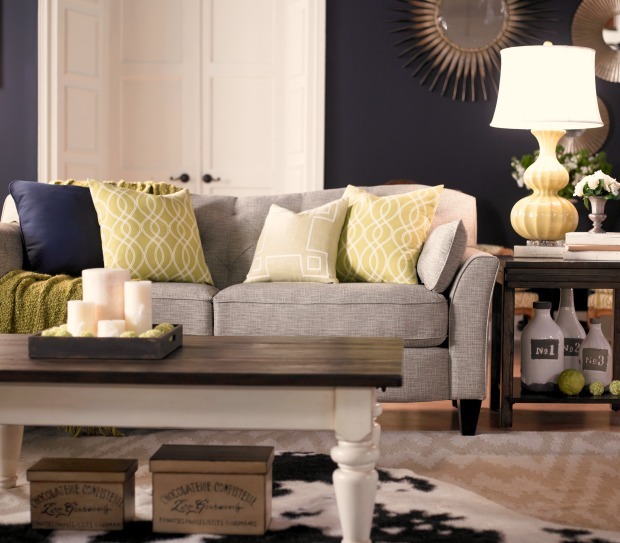 We are planning on purchasing new living room furniture this Jan. can’t wait to see what selections they have! Thanks for having the contest, I am off to vote! I am in love with the couch you picked out! The color, the shape, it’s perfect 🙂 However, I don’t think my fiance would go for it, so I think I would pick the Delaney Premier Stationary sofa. Great eye for detail. Your room looks beautiful. i would love any type of sectional or leather chair! I would love to purchase one of their twin sleep chair. Amazing gift to purchase amazing items! Good luck Beth! I’m in love with their Sinclair Sectional!! Lancer Power La-Z-Time® Full Reclining Sofa W/ Fold Down Table! Thank you Erica! I love it too :). Love the whole room! Gorgeous! Gorgeous room! Love the chandelier print. My favorite piece is the Daphne Supreme Comfort Full Sleep Sofa. And I need one right now. Thanks. I would love a new recliner! I like their Caroline Stationary accent chair. Your room is beautiful! Great job! The Mackenzie Stationary Chair would look great in my living room. Loving the Baja Etagere…so many possibilities! Great giveaway, Beth ! I have been shopping for sofas and the Kinsley Premier Stationary Sofa would be perfect. Love the colors that you used. Would love to win a recliner for my hubby. It would come in handy for when he has a migraine during the night. I love the wall color you picked! I would get a new rug for my den – ours is really too small for the room. I like the Emerson Low Profile Recliner. Pembroke Premier Stationary Sofa! The room is gorgeous! I love the “Daphne Supreme Comfort” Twin Sleep Chair. The room is beautiful! Wonderful give-aways and great job on the room. oh man, I love the fabric you chose. I’ve seen the fun houndstooth pattern-i’d love an accent chair like that. Great giveaway, thanks for the chance. Love that sofa. Beautiful job! The whole room is gorgeous! I love your style! The sectional is great. Lovely room! I checked out the site and really liked the Aria Stationary Occasional Chair. I was shocked by how many different coverings options are available for it! I love the griffin sectional with sleeper. I love all of their rugs! 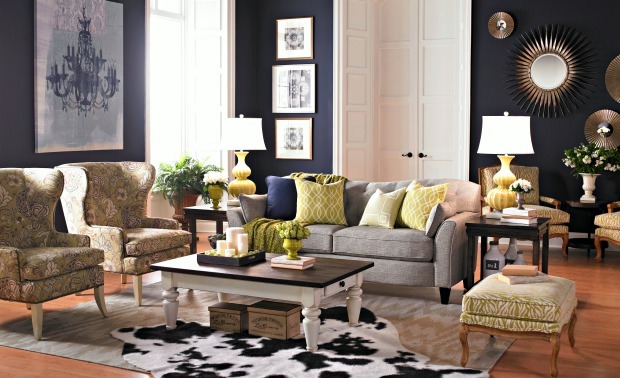 So many gorgeous items ~ I’m lovin’ their Collins Sectional though. I love your room. It is a room I could live in too. The were a lot of good ones but yours leans more to my style!! Love the room, especially the rug! WOW those are some beautiful peices . I just got a new Lazyboy recliner and love it!